Piraha: Cognitive anumeracy in a language without numbers. What Happens When a Language Has No Numbers? 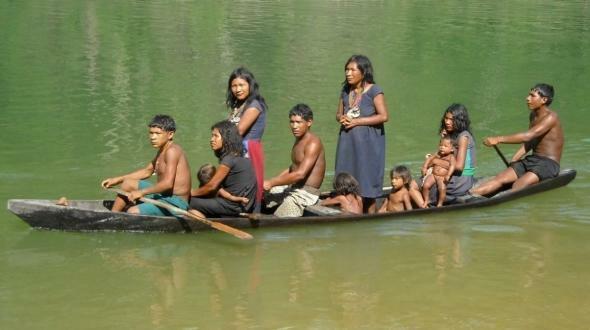 Pirahã people on the Maici River in Amazonas, Brazil. Photo courtesy of Tony Muricy. Unrelated to any other extant tongue, and based on just eight consonants and three vowels, Pirahã has one of the simplest sound systems known. Yet it possesses such a complex array of tones, stresses, and syllable lengths that its speakers can dispense with their vowels and consonants altogether and sing, hum, or whistle conversations. With no way to express exact integers, the obvious question is: How do the Pirahã count? More pragmatically, how do they ask for two of something instead of just one? The answer—according to some of the more recent research on anumeracy, published by anthropological linguist Caleb Everett in the journal Cognitive Science—suggests, almost inconceivably, that they don’t. Everett, the son of Christian missionaries turned linguists, lived on and off with the Pirahã during his early childhood. His parents, he told me, speak Pirahã as fluently as any Westerners ever have, though for a non-native speaker to master the language is a near impossibility. A couple of years ago, Everett (whose father was featured in the New Yorker piece) traveled back to the Pirahã villages to run a few very simple experiments. For one test, he would lay down on a table a line of evenly spaced items, say batteries, and ask the Pirahã to make a second line just like the first. For another, he would show someone a line of items and then hide it from view. Again, he would ask for a second line just like the first. In both cases, no mistakes were made as long as the lines were just two or three items long. But, as Everett wrote in his paper, “The proportion of correct responses generally drops significantly for numbers exceeding 2 or 3.” This was true for all tasks, including a non-visual test that involved clapping. English speakers, on the other hand, make no errors at all, except when a relatively long line of items, say seven or more, is shown quickly and then hidden. We can only count so fast, after all, but the Pirahã appear not to be counting at all—because, well, how could they? Instead, they’re employing what Everett calls an “analog estimation strategy,” which works well for a few items but breaks down beyond that. The Pirahã consider all forms of human discourse other than their own to be laughably inferior, and they are unique among Amazonian peoples in remaining monolingual. In our increasingly data-driven culture, where we reincarnate ourselves more and more as spreadsheets, anumeracy is unthinkable. Many fear, amid the “advanced stats” revolution in all aspects of life, that what it means to be and feel human is forever changing, and not for the better. It’s perhaps comforting to know, then, that while we’re busy charting our heart rate and measuring our intake and poring over the wins above replacement values for our fantasy league, the Pirahã, immune to the relentless tyranny of numbers, will simply enjoy the game.